For the best experience on our site, please turn off compatibility view in the tools menu, or use a different browser. 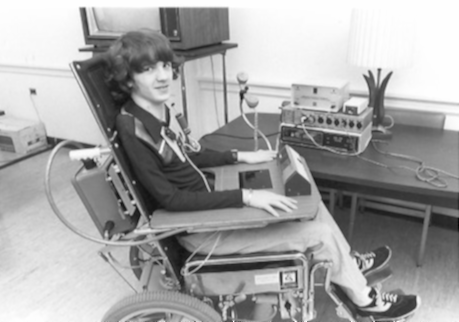 The History of the Prentke Romich Company (PRC) IS the History of alternative and augmentative device technology. 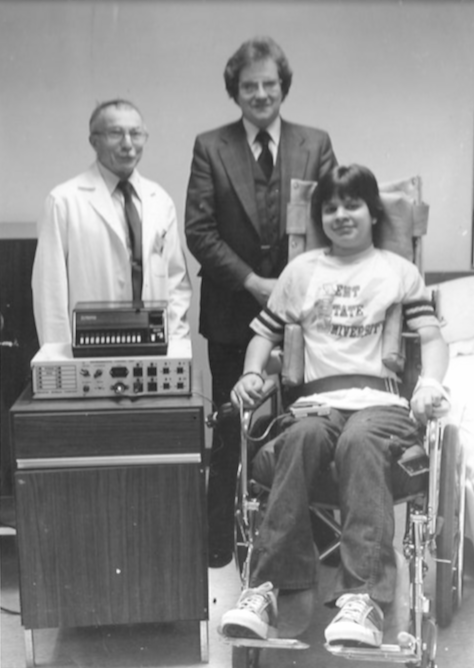 It all began in the early 1960's when Barry Romich, a freshman engineering student at Case Western Reserve University, met Ed Prentke, an engineer at Highland View Hospital in Cleveland, Ohio. The two men soon found they had a similar mission: to help individuals with disabilities. Prentke and Romich decided to form a partnership and, in 1966, the Prentke Romich Company was born. 1966: Ed Prentke and Barry Romich meet and form Prentke Romich Company. 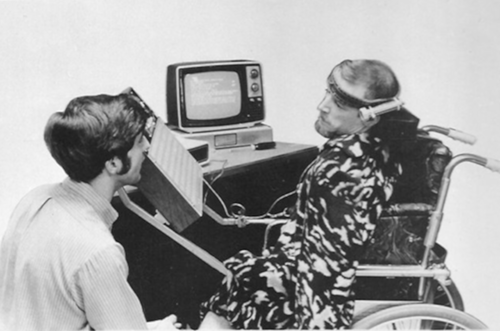 1969: PRC produces its first communication device, a typing system based on a discarded Teletype machine. 1973: PRC moves from Barry’s basement in Madisonburg to its first facility in Shreve, OH. 1975: The Veterans Administration orders a large quantity of Automatic Dialing Telephones, for users to make and receive telephone calls. This order gives PRC the boost it needs to grow. 1975: PRC welcomes the ECU-1, a 14-channel scanning environmental control device that permitted control of external devices. 1979: The Express 1, a microprocessor-based communication device, is developed. 1982: Prentke Romich teams with Bruce Baker of SEMANTIC COMPACTION® to incorporate the MINSPEAK® vocabulary in PRC devices. 1982: The Express 3, the first device with synthesized speech capabilities, is introduced. 1983: The MINSPEAK 1 (a repackaged Express 3 with MINSPEAK) is officially introduced at the 1st MINSPEAK Conference. 1984: The Touch Talker, the first portable device from PRC, debuts. 1984: The company moves to its present location in Wooster. 1985: The LightTalker begins production. The device introduces a streamlined, tethered headpointing system for users unable to use their hands for access. 1986: Liberator, Ltd. is formed in the UK, with PRC owning half interest. 1988: PRC enters the digitally recorded speech arena with IntroTalker. 1989: Prentke Romich Europe is formed. 1990: Prentke Romich Deutschland is formed. 1993: PRC receives U.S. Department of Education grant for Unity® development. This gives the company the ability to develop new language systems. 1995: As a result of the grant, PRC launches Unity, the foundation for the vocabulary in most PRC products. 1996: Saltillo, a sister company to PRC, is created. 1997: PRC begins sponsoring the annual lecture at the American Speech-Language Hearing Association (ASHA) conference. The lecture is renamed to honor Edwin and Esther Prentke. 2000: The Pathfinder, the first product to introduce an LCD touchscreen as part of the device, launches. 2001: The Vantage, the first all-touchscreen device, is introduced. 2005: The ECO-14, with Windows accessibility, email and Internet capabilities, is released. 2006: In Australia, PRI Liberator Pty Ltd is created. In 2007, the company is renamed Liberator Pty Ltd.
2006: PRC receives ISO certification. 2007: PRC introduces the Language Acquisition through Motor Planning (LAMP) language system for those with autism. 2008: PRC becomes a 100% employee-owned company. 2009: PRC launches the AAC Language Lab® as a resource for parents, teachers and clinicians to encourage language development. 2009: The Center for AAC & Autism is established to promote Language Acquisition through Motor Planning (LAMP). 2009: The ECOPoint, the first device to utilize an eye-tracking system, is released. 2010: The Essence® family of languages, with a vocabulary designed for literate adults, is introduced. 2012: PRC releases its first app, LAMP Words for Life. 2012: The Accent® 1200 is introduced. For the first time, PRC no longer manufactures devices, instead starting with an external product. 2012: NuEye®, a state-of-the-art eye-tracking system, is released. 2014: Realize Language™, an innovative, online data-monitoring services is brought to market. 2015: PRC releases CoreScanner™, a progressive vocabulary program for switch users. 2015: NuPoint®, a head-tracking system for those with limited hand use, is introduced. The module is able to be used on all PRC devices as an additional feature. 2015: PRiO®, an iPad-based communication tool, featuring the iPad Air and LAMP Words for Life language system, debuts. 2016: PRC celebrates its 50th anniversary. Copyright © PRC-Saltillo. All Rights Reserved.